VMware introduced HTML5 desktop access using the Blast protocol in Horizon 5.2 and later. This provided another method for accessing virtual desktop environment. However, it had a few concerns like use of port 8443, limited features compared to PCoIP, and was not very bandwidth efficient. VMware Blast Extreme in View 7, supports the broadest range of client devices that are H.264 capable. 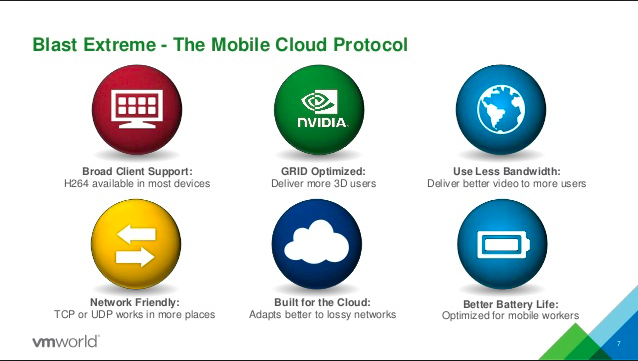 VMware Blast Extreme protocol is optimized for the mobile cloud. VMware Blast extreme offers the lowest CPU consumption for longer battery life on mobile devices. VMware Blast Extreme can compensate for an increase in latency or a reduction in bandwidth and can leverage both TCP and UDP network transports. Blast Extreme is a dual-stack protocol. That means that it will work over both TCP and UDP. UDP is the preferred communications method, but if that is not available, it will fall back to TCP-based connections. The VMware Blast display protocol can be used for remote applications and for remote desktops that use virtual machines or shared-session desktops on an RDS host. The RDS host can be a physical machine or a virtual machine. The VMware Blast display protocol does not operate on a single-user physical computer. 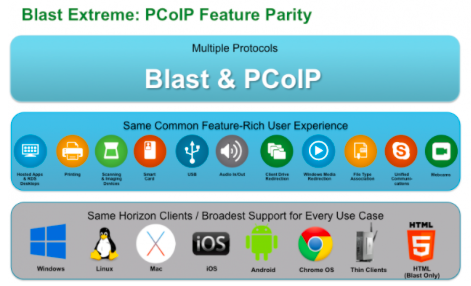 Blast Extreme also has feature parity with PCoIP. It supports all of the options and features available today including client drive redirection, USB, unified communications, and local printing. Blast Extreme is not strictly a web-only protocol. It can be used with the new Windows, MacOS, Linux and mobile device clients, and it works over standard HTTPS port. Users outside the corporate firewall can use this protocol with your company's virtual private network (VPN), or users can make secure, encrypted connections to a security server or Access Point appliance in the corporate DMZ. Advanced Encryption Standard (AES) 128-bit encryption is supported and is turned on by default. You can change the encryption key cipher to AES-256 if required. Connections from all types of client devices. Optimization controls for reducing bandwidth usage on the LAN and WAN. 32-bit color is supported for virtual displays. Audio redirection with dynamic audio quality adjustment for LAN and WAN. Real-Time Audio-Video for using webcams and microphones on some client types. Copy and paste of text and, on some clients, images between the client operating system and a remote application or desktop. For other client types, only copy and paste of plain text is supported. You cannot copy and paste system objects such as folders and files between systems. Multiple monitors are supported for some client types. On some clients, you can use up to 4 monitors with a resolution of up to 2560 x 1600 per display or up to 3 monitors with a resolution of 4K (3840 x 2160) for Windows 7 remote desktops with Aero disabled. Pivot display and autofit are also supported. When the 3D feature is enabled, up to 2 monitors are supported with a resolution of up to 1920 x 1200, or one monitor with a resolution of 4K (3840 x 2160). USB redirection is supported for some client types. MMR redirection is supported for some Windows client operating systems and some remote desktop operating systems (with Horizon Agent installed). For information about which client devices support specific VMware Blast Extreme features, go to https://www.vmware.com/support/viewclients/doc/viewclients_pubs.html. 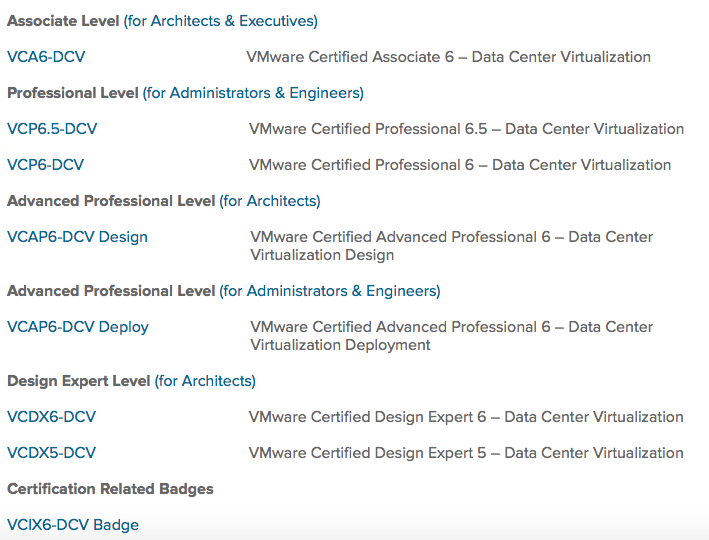 Introducing a new certification: VMware Certified Professional 6.5 – Data Center Virtualization. This new certification provides you an opportunity to prove your expertise in the latest version of the industry-leading virtualization platform. 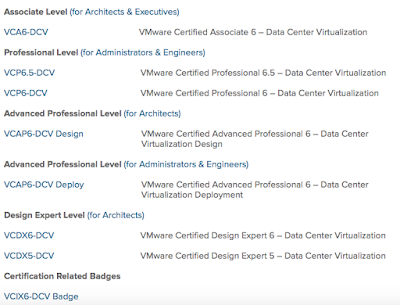 For those who already have your VCP, this new VCP provides a new path and recertification opportunity. For more details do check following page. Connection Server, Security Server, and View Agent or Horizon Agent. 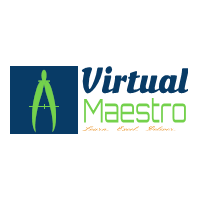 • Latest maintenance release of View 5.3.x and later releases. • VMware recommends to use a security server so that device will not require a VPN connection. • To use the Unity Touch feature with View 5.3.x desktops, the Remote Experience Agent must be installed on the desktops. Install Horizon Client for Chrome OS just like any other Chrome OS applications. 1. Search for the Horizon Client for Chrome OS application in the Chrome Web Store. 3. To determine that the installation is successfully completed, verify that the Horizon Client for Chrome OS application icon appears in the Chrome Application Launcher.